"Treat the surrendering Biafrans well or risk their children rising again"- Colonel Phillip Effiong, Vice President of Biafra, 1970. These profound words from a wise and deeply courageous man have proved to be prophetic. The truth is that those that resist the idea of restructuring and that say no to the conducting of a referendum on self-determination by the ethnic nationalities in Nigeria are arch-conservatives that seek to preseve what the French call the "ancien regime". They are people that have fed fat on Nigeria and the very idea of dismantling and reforming our constitutional structure, redefining our nation and allowing the will of the people to be done terrifies them beyond belief because they stand to lose everything. They remind me of the dark and relentless forces that once opposed the break-up of the Soviet Union. They remind me of the sinister and savage forces that once supported apartheid and opposed black majority rule in South Africa. They remind me of the Royalist forces in pre-Cromwellian England who opposed parliamentry democracy and who believed in the absolute power and divine right of kings. They are ignorant, self-serving, reactionary, godless and cruel people that are still living in an inglorious, inequitable and unconscioble past. Worst still, they are suffering from chronic delusions and they are out of touch with reality. They are modern-day slave masters who seek to preserve and protect a cruel, moribund, retrograde, unjust and failed system which serves their interest alone and which cages and destroys the future and destiny of our people. They use childish tales about the horrors of war to deter us from insisting on our rights and fighting for our freedom. They insist that we must accept the fact that we are slaves and second class citizens, that the "Christians are nothing" and that Nigeria was bequethed to them and their misguided and servile friends and allies by our erstwhile and ever so reactionary British colonial masters. They use the security agencies, the Armed Forces, the traditional rulers, the media, the ruling class, the political elite and all the other tools of oppression to intimidate and demonise us, paint us black, stand in our way and drown our voices but in the end they will fail and we shall prevail. The insightful Mr. Phil Smart wrote that "the ultimate test of a democrat are his views on self-determination". He is right. Mr. Jude Nwadavid asked "can someone explain how asking for self-determination translates into asking for war and bloodshed?" He asked "could it be that a man asking for divorce from an unfaithful wife is actually asking for war from the in-laws and other relations?" These are pertinent and appropiate questions from a keen and erudite mind which those that threaten war and spit hell-fire and brimstone each time they hear the words "restructuring" and "self-determination" need to answer. 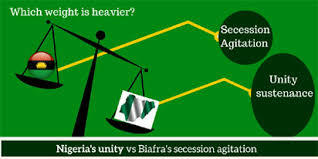 "If the North says they want to seccede would those that oppose Biafra reason the way they are reasoning? If they did not oppose sharia law why bother about Biafra?" The truth is that there can be no peace without freedom and justice and the prayer is "may the Lord trouble those that seek to trouble us". The prayer is may He cage the monsters that oppose restructuring and may He disarm and remove the teeth and strength of the beasts that threaten war. Regardless of their insults and threats we shall march on and secure our collective freedom. The numerous ethnic groups that make up Nigeria deserve no less. It is a march of courage, righteousness, equal rights and justice to which a million voices sing. The forces of darkness and the internal colonial masters cannot stop a moving train: they shall bow to the will of the people and the counsel of the Living God. Permit me to end this contribution with the following observations, admonitions and counsel. Nigeria is an evil, boiling cauldron of suffering that is filled with body parts and entrails and that has destroyed the dreams and consummed the lives of millions of innocent and precious souls over the years. It has offered those souls as human sacrifices to the principalities and powers of the second heaven, to the demons of the underworld and to the deities of the River Niger. This was all done in a vain attempt to sustain her sordid and repugnant unity and existence and to hold her spell-bound in the shape and form of a vanquished territory and barbarous vassal state which is under the power and control of shape-shifting reptilians, the servants of satan, the seed of Futa Jalon, the children of perdition and the born to rule. Only the blood of Jesus and the light and power of the Living God can save and redeem our nation from Lucifer, the Son of the Dawn, the Bright Morning Star.and the goat-headed Baphomet. Only His power and might can deliver us from satan, the Lord of the Flies, the whispering serpent and the destroyer of humanity. To the Daughters of Zion I make this humble appeal: fear not, stand firm and pray hard for we wrestle not against flesh and blood but against principalities and powers. You are the watchers of the Kingdom, the shield-bearers of light and truth, the servants of the Lord of the Universe and the handmaidens of the Most High God. I urge you to stand in the gap and to pray for the Lord's counsel to stand over our nation. I urge you to pray for your brothers and sisters in the faith. I urge you to pray for the restructuring and a redefinition of our nation. I urge you to pray for the struggle for freedom and for self-determination. I urge you to pray for the rise of men and women of courage and strength that will lead that struggle. I urge you to pray for the emergence of new nation states that are berthed and born as a consequence of the expression of the free will of the people. I urge you to pray that your children are not captured and enslaved as you and your forefathers were from time immemorial. I urge you to pray that they are not subjected to the insults, humiliation, indignities, violence and tyranny that millions of their forefathers were subjected to for the last 57 years. I urge you to pray against the monsters that oppose restructuting and the fight for self-determination and the beasts that threaten war. I urge you to invoke the blood of the sprinkling, to call on the name of our resurrected Lord and to fight a good fight in the realm of the spirit. We need your strength today more than ever before whilst we confront the beasts in the field and fight the battle in the forest. And in all our collective trials, tribulations, struggles, challenges and encounters I urge you to always remember this: that our cause is just, our resolve is strong, our fight is noble and our struggle is righteous. I urge you to remember that no matter how hard the battle and no matter how bitter the struggle, the Lord of Hosts is with us and the Ancient of Days guides our steps and champions our cause.